Sometimes I like to mix up my maze making and try something different. One of the advantages of working exclusively on a computer tablet is it allows me to experiment with different techniques. 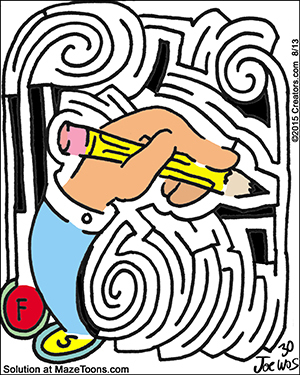 For most mazes I am drawing lines and those lines form a path. When I work in negative fields I am drawing the path directly. I use a black field and then just draw with a white line to create the path. They can be a little challenging to create and tend to be easier to solve, which I probably why I don’t do too many of them! Next It’s National Chicken Month!